After months of cold war with the Congress high command, Jagan Mohan Reddy, son of former chief minister Dr Y S Rajasekhara Reddy, quit the Congress party and as member of Parliament. I am writing this letter to you with a very heavy heart and deep anguish. I have been suffering humiliation in silence during the last 14 months. A malicious campaign was being unleashed against me, my family and lastly against my late father and a great leader of masses Dr YS Rajasekhara Reddy. Though I have been observing utmost restraint, concerted efforts were being made to send me out dim my late father's image and prestige. But, the last straw was the conspiracy that is being hatched to vertically split the family of the great leader who brought back Congress party to power in Andhra Pradesh twice. I was shocked at the murky and disgusting politics being played at my back. Is it fair to lure my uncle YS Vivekanada Reddy to Delhi, thereby paving way for fissures in my family? I was deeply hurt over the reports in media that my uncle went to Delhi at the instance of Gulam Nabi Azad. Media reports revealed that this conspiracy was hatched to rein in Jaganmohan Reddy by provoking his family members against him. Does it not tantamount to a conspiracy against my family and myself? Slowly it dawned on me that deliberate attempts were being made to throw me out of the party and malign the image of the towering leader late YS Rajasekhara Reddy. Why all this? What is the sin I have committed? Why this animosity against my family and myself? Why efforts are being made to blur my late father's image? Did I commit anything wrong? What is it? When 150 MLAs supported my candidature for the chief minister's post after my father's unfortunate demise, I acted as per your direction without any second thoughts? Is it a mistake? Honouring your directions, did I not support the candidature of K Rosaiah as Chief Minister Is it the mistake I committed? As recently as a few days ago, when you wanted to replace Rosaiah with N Kirankumar Reddy, did I not cooperate for the smooth conduct of the Congress Legislature Party meeting . Is it also a mistake? Then what is the sin I have committed . Is it Odarpu Yatra? I have repeatedly informed you that it was my personal programme and it was my duty and responsibility as the son of the departed leader. My father was a great mass leader with no comparison in contemporary politics. Unable to bear the sudden death of the great leader hundreds of people either died due to shock or committed suicide. Their families were orphaned. In this backdrop, within 20 days of my father's death, attending a commemoration meeting at Pavuralagutta, where my father's helicopter crashed, I had announced that I would visit the houses of each and every victim and share their grief. I made the promise for the sake of my father. There was every need to fulfill the promise and also to honour the tradition of consoling the victim's families by going to their houses, I sought your permission. Though Odarpu Yatra was to commence last November, I have postponed it on your advice. Subsequently, I launched Odarpu Yatra. That is when I became a target and attacks were mounted against me from different quarters. The only reason was that the response to Odarpu Yatra was overwhelming and unprecedented. Bigwigs in the Congress party could not digest the fact that people were still fresh with the memories of Rajasekhara Reddy and he would be in their hearts eternally. They started making willful, misinformation and malicious campaign against Odarpu Yatra. Though they attributed motives to me, I preferred to ignore the malicious campaign as the conspiracy of some over jealous leaders who had been squirming over the popularity of my late father. 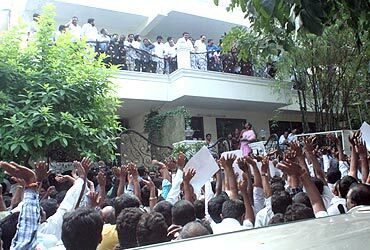 But, with the series of happenings and developments, I started realising bitter reality that deliberate attempts were being made to wipe out the image of Rajasekhara Reddy from the hearts of the people, who loved him much. 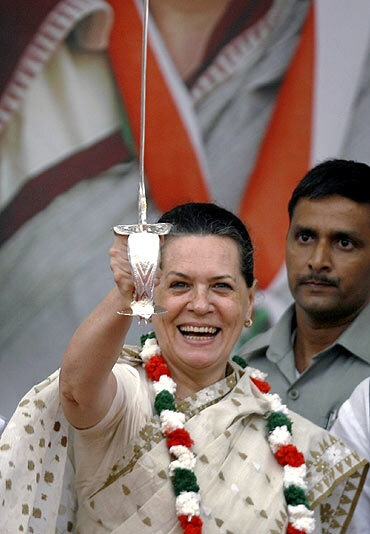 I realised that unfortunately these forces have the blessings of none other than the party high-command itself. My mother Viyalakshmi addressed a letter to you seeking your appointment to explain the necessity of Odarpu Yatra. We could get your appointment only a month later whereas some new friends who had opposed the Congress party and yourself could get your audience within 24 hours. Is it not discrimination against my family? My mother, sister and myself, we three met you personally and explained the necessity of Odarpu Yatra. But, there was no improvement in the situation. On the other hand, things turned from bad to worse. Telephone lines between Delhi and the Chief Minister became busy. The chief minister in turn called the ministers and the ministers instructed the party leaders not to attend Odarpu Yatra. Besides, the Ministers and MLAs were ordered not to attend Odarpu Yatra. Why anyone should stoop down to the level of opposing installation of statues of late Rajasekhara Reddy though people themselves pooled up money and wanted to unveil his statues. I fail to understand how will installation of Rajasekhara Reddy's statues in each and every village would damage the Congress party in the state? Why such a willful campaign was launched against his statues? Continuing the tirade against late Rajasekhara Reddy's followers, action was initiated against those who participated in the Odarpu Yatra and those who stood by me. While efforts were made to sabotage Odarpu Yatra, on the other hand, simultaneous malicious campaign was unleashed against my family and me. Morality levels touched a nadir and these forces joined hands with the media houses, who had openly announced that Congress was their bitter foe, and made baseless allegations against me. These forces did not even spare the departed leader and made shameless allegations against late Rajasekhara Reddy who is no more to defend himself. Some leaders even convened press conferences to malign my father's image. They stooped down to this level immediately after meeting you personally. Though such disgusting and malicious campaign was on full throttle, neither the party nor the Cabinet preferred to condemn the campaign. It was the same Cabinet which was constituted by my father and it was part and parcel of all the decisions taken by YSR government. Yet, none of the ministers preferred to counter the campaign. At the same time, another effort was being made to wipe out the image of Rajasekhara Reddy. 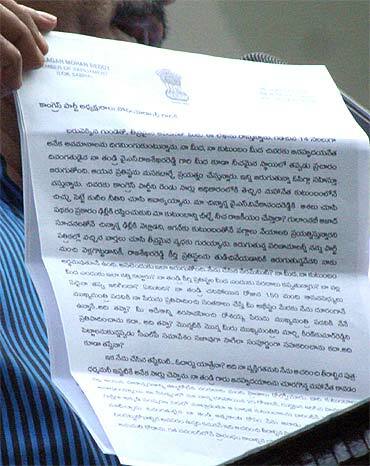 Even YSR's photos were missing from Congress party programmes and government functions. Outraged over this attempt, people began raising their voice in the meetings. Yet, there was no change in their attitude. But, what shocked me most is the "eye wash" investigation over the demise of my late father. The people of the state including me have doubts over the helicopter crash which caused the unfortunate demise of my father. Either the Central Bureau of Investigation or the high-level Expert Committee, which probed the helicopter crash could not answer the doubts satisfactorily. The doubts remained as unanswered questions till date. The high-profile investigation failed to fix responsibility on any single individual. My letter to the Central government seeking answers to these doubts also proved futile. But, I, as a disciplined soldier of Congress party, preferred to maintain silence with pain as further raking up the issue from my side would give scope for further malicious interpretations against me. Hence, I would like to recall that police raided Sakshi office after it telecast a discussion based on a report of a Russian website on the demise of Rajasekhara Reddy. Every attempt was being made to project me as "anti-party". 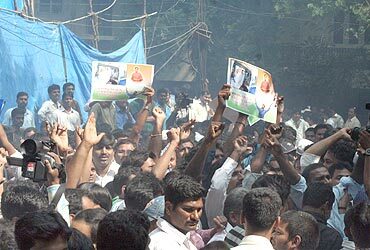 Some Congress leaders attacked Sakshi office after a political analysis was telecast a few days ago. They spread lies that I had conspired against the party and party leadership. Sakshi Channel telecast a political analysis on the occasion of 125th years of Congress party. The analysis carried some positive and some negative remarks and some advantages and disadvantages were also discussed. Other channels and newspapers had also put out similar stories. Similarly, an analysis was also telecast on Bihar elections in Sakshi and other channels as well. The adversaries even faulted this news analysis programme. I would like to bring to your notice an important issue. During the launch of Sakshi newspaper and later Sakshi Channel I had openly declared that they are not Congress party mouthpieces and they would work independently and impartially. On these two occasions, besides late leader Rajasekhara Reddy, Congress party senior leaders like Veerappa Moily and Anand Sarma were present. Besides, the PCC president, ministers and several state leaders of other political parties also graced the two occasions. None of these leaders raised objections then. Now, a deliberate conspiracy had been hatched against me by spreading lies that anti-Congress stories are being telecast or written in Congress channel and Congress newspaper. Sakshi offices were attacked. On the instructions from Delhi, some of the Youth Congress leaders staged demonstrations with a sole aim of branding Jaganmohan Reddy as "anti-Congress". Do we need any other reason to believe that a conspiracy has been hatched to remove me from the party. Now, finally, a screen play has been written and being implemented to split our family. For how long, I should remain restrained? Upping the ante against me as part of the disgusting political conspiracy, day in and day out, baseless reports like I am being removed from the party were being planted in the media. It has reached a stage that even a small kid in the state would tell that Jaganmohan Reddy would be shunted out of the party in a day or two. 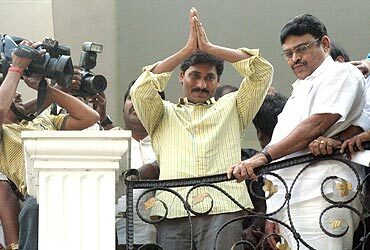 Even the common people strongly believe now that the axe would fall on Jaganmohan Reddy. Is it worth to suffer such a humiliation? Is it worth to witness such malicious campaign? I strongly feel that there is no point in continuing in the party bearing all the humiliation and also remaining mute spectator to the conspiracy to malign the image of the great leader. I have realised that as long as I remain in the party it is impossible to reach and to be among with crores of people who had always loved the great leader. My father had dedicated his life for the party. But, my family is in a situation created by these forces with the blessings of the party high-command and we have no option but to leave the party. I have no other option before me. My mother Viyalaxmi and myself have decided to resign to the primary membership of the Congress party. My mother Vijayalaxmi is resigning to the Member of Legislative Assembly post and I am resigning to the Member of Parliament post. The wish was to isolate and send me out. But, I would like to clarify one important issue to you. Deliberate campaign was run against me by the Congress leaders that I am hatching conspiracy to throw out Andhra Pradesh government. I am not of that character. My father taught me to live by word even if it costs me anything. He taught me to protect credibility and maintain high moral values in both public and private life. I strongly believed in what my father taught me and I had never deviated from the path. I will never stoop down that low. I am drawing your attention once again. Even when 150 MLAs supported my candidature also, I honoured your wish but did not indulge in any coup like TDP president N Chandrababu Naidu and attained power because I am a man of morals. When you desired to make Rosaiah the chief minister, I myself proposed his name in the Congress Legislature Party meeting. I did so for the sake high moral values. I have cooperated for the smooth conduct of the Congress Legislature Party meeting convened to elect Kirankumar Reddy as the chief minister to keep up the values. With the same moral values, I have designed Sakshi Media group to act independently and impartially. The people of the state recognised our sincerity and commitment. Credibility is the hallmark of the Sakshi Media Group. By upholding higher moral values, Sakshi newspaper created a record of sorts by crossing 14 lakh copies circulation mark within two years of launch. As you are apprehending that I might bring down the government in Andhra Pradesh, I am assuring with the same spirit of high moral values. I am appealing here itself to all the MLAs of the party who adore my late father dearly and who love me. Please do not resign for my sake . Wherever you are, your love and affection are invaluable to me. My father had always taught me that "it is not important how long we live... but how we live". As my father taught me... character, credibility and high moral values are guiding forces for me and they will guide me.